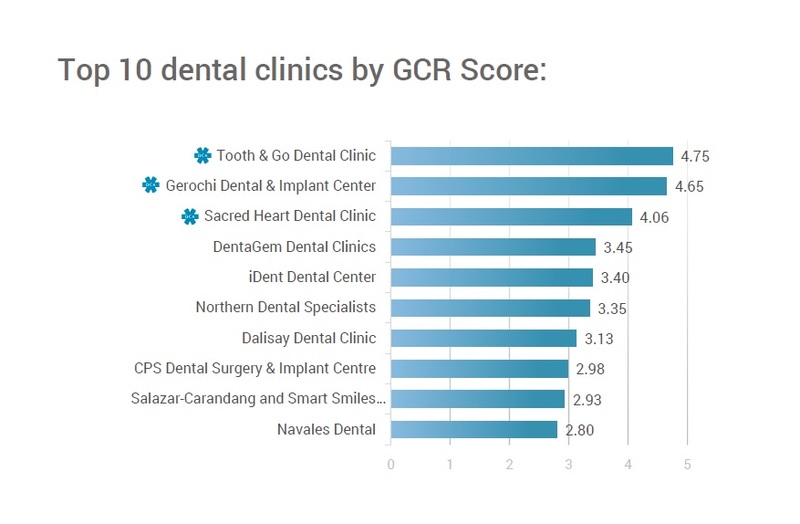 According to the GCR’s latest analysis of TOP 10 Dental Clinics 2017 in the Philippines, Tooth & Go Dental Clinic ranks as the leading clinic when it comes to overall international clinic reputation. A total of 751 dental clinics were included in the study. The average GCR dental clinic quality score was 2.47. This fact demonstrates the huge range of rising healthcare standards available in the country. The GCR – Global Clinic Rating is the leading provider of healthcare clinic ratings worldwide. It aggregated and analyzed dental clinics throughout the Philippines during 2017 including dental clinics in Manila, Parañaque, Marikina, Makati, and others. Tooth & Go Dental Clinic in Parañaque ranked #1 with a GCR Score of 4.75. It ranks #3 from 125,856 dental clinics monitored worldwide, followed by the Gerochi Dental & Implant Center (4.65) and the Sacred Heart Dental Clinic (4.06). It is important to mention that all of this three clinics came out almost top (4.1-4.7) for their Feedback Score. The GCR Scores may change daily, depending on what has been recently changed within clinics’ expertise, facilities, services and patient feedback. Every little change in clinic’s profile can affect the overall GCR Score of that particular clinic. Dental services in the Philippines are very high value for their prices. Many foreign tourists are attracted by this country because of lower prices and world-class expertise and quality of treatments. The number of international patients is growing, but the Philippines are still struggling to attract more medical tourism patients from Australia & the US due to increasing competition from Thailand and Singapore. The GCR clinic star symbol represents that the clinic has been officially verified as meeting or being above international medical clinic standards. It uses the data provided by the GCR to constantly improve the clinic for their patients. 3 clinics in the Philippines have achieved the GCR international accredited clinic status. Download the GCR’s full report the Philippines: Top 10 Dental Clinics in 2017 to discover the names of the other dental clinics that made it to the Top 10 dental clinic list in the Philippines and to find some brief statistics of these clinics. « Medical Clinic Christmas Crush – How to handle it?